(7) Uddhava said: 'What can I say about our wellbeing now the sun of Krishna has set and the house of my family has been swallowed by the great serpent of the past? (8) How unfortunate this world is and especially the Yadu dynasty who, living together with the Lord, did not recognize Him any more than the fish recognize the moon? (9) His own folk, the Sâtvatas, were audacious people with a good judgement of character who could relax with Him being the head of the family and thought of Him as the one behind everything. (10) The intelligence of the souls who are innerly of full surrender to the Lord will never go astray because of the words used by others contaminated by the influence of the bewildering external reality of the Divine Person [or the gods]. (11) He who showed His form to everyone in the world, managed to put an end to it by removing Himself from the eyes of those people who lived without penance and were unsatisfied to see Him. (12) The form He showed in the mortal world was perfectly suited for His pastimes that demonstrated the power of His inner magic [His yoga-mâyâ]. It led to the discovery of His wonders, His supreme opulence and the ultimate ornament of all ornaments: His feet. (13) All the [inhabitants of the] three worlds who during King Yudhishthhira's Rajasûya-[royal] sacrifice witnessed His all-attractive form, were perplexed and thought that the craftmanship of Brahmâ's universal creation had been surpassed with Him being present in the mortal world. (14) Because of His smiles, playful nature and glances the women of Vraja became more and more attached to Him and followed Him with their eyes, so that they completely distracted sat down with their mind in the clouds, without attending to their household duties. (15) The Unborn One who yet took birth, the infinitely merciful Lord and ruler over the spiritual and material realm, appeared for the sake of the devotees as the Fortunate One, the Lord of the Opulences, as Bhagavân who accompanied by all His associates is as fire to all the others who, [like Kamsa] living to their own material standards, constitute a plague. Third revised edition, loaded October 17, 2016. S'uka said: 'The great devotee [Uddhava] questioned by Vidura about what could be said regarding the Dearest One, reflected upon the Lord but could not reply immediately because he was overwhelmed by emotion. He was someone who in his childhood being five years old, called by his mother for breakfast, did not like to have it because he was absorbed in playing the servant [of Lord Krishna]. How would such a servitude of Uddhava have slackened in the course of time? So when he was simply asked to speak about Him, everything of the Lord's lotus feet popped up in his mind. For a moment he fell completely silent because of the nectar of the Lord's feet. Strong as he was and well matured in the union of devotion, he became fully absorbed in the happiness of that excellence. Every part of his body showed the signs of transcendental ecstasy and when tears filled his eyes because of missing Him so much, Vidura could see that he had reached the object of his greatest love. How unfortunate this world is and especially the Yadu dynasty who, living together with the Lord, did not recognize Him any more than the fish recognize the moon. His own folk, the Sâtvatas, were audacious people with a good judgement of character who could relax with Him being the head of the family and thought of Him as the one behind everything. The intelligence of the souls who are innerly of full surrender to the Lord will never go astray because of the words used by others contaminated by the influence of the bewildering external reality of the Divine Person [or the gods]. He who showed His form to everyone in the world, managed to put an end to it by removing Himself from the eyes of those people who lived without penance and were unsatisfied to see Him. The form He showed in the mortal world was perfectly suited for His pastimes that demonstrated the power of His inner magic [His yoga-mâyâ]. It led to the discovery of His wonders, His supreme opulence and the ultimate ornament of all ornaments: His feet. All the [inhabitants of the] three worlds who during King Yudhishthhira's Rajasûya-[royal] sacrifice witnessed His all-attractive form, were perplexed and thought that the craftmanship of Brahmâ's universal creation had been surpassed with Him being present in the mortal world. Because of His smiles, playful nature and glances the women of Vraja became more and more attached to Him and followed Him with their eyes, so that they completely distracted sat down with their mind in the clouds, without attending to their household duties. The Unborn One who yet took birth, the infinitely merciful Lord and ruler over the spiritual and material realm, appeared for the sake of the devotees as the Fortunate One, the Lord of the Opulences, as Bhagavân who accompanied by all His associates, is as fire to all the others who, [like Kamsa] living to their own material standards, constitute a plague. It distresses me to see how He, being unborn, so amazingly took His birth [in the prison] where Vasudeva lived, how He in Vraja at home with Vasudeva, lived like He was afraid of the enemy [uncle Kamsa] and how He, the unlimitedly powerful one, fled from Mathurâ city [the capital where Krishna resided after defeating Kamsa]. How can one forget Him once one has the dust of His lotus feet in the nose, He who by the mere raising of His eyebrows dealt the death blow to the burden of the earth? Did your goodness not witness with your own eyes how during Yudhishthhira's royal sacrificial ceremony the king of Cedi [S'is'upâla], despite his being jealous of Krishna, attained the perfection, the fulfillment most desired by all the yogis who by dint of their yoga manage to tolerate it to be separated from Him? And certainly also others in human society have achieved His heavenly abode: they who as warriors saw Krishna's very pleasing lotus-like face and eyes on the battlefield that was purified by Arjuna's arrows. He is no one else but the unique, grand Lord of the threefold reality by whose independence supreme fortune is achieved and at whose feet countless [kings full of] desires bow their helmets, being of worship with all the paraphernalia under the direction of the eternal keepers of societal order. To the shelter of whom else should I take? Oh, who else would assure a greater mercy than He who, despite the faithlessness of that she-devil [Pûtanâ] who in envy poisoned her breast for nourishing Him to death, granted her the position of a mother? I think that they who as opponents are waging against the Lord of the Threefoldness are factually great devotees because they in their preoccupation of fighting Him, could see Him coming forward on His carrier [Garuda] with His cakra weapon. Born from the womb of Devakî in the prison of the king of Bhoja [Kamsa], the Supreme Lord being prayed for [by the Creator] appeared to bring welfare on earth. Thereafter He was brought up in the cow pastures by His [foster] father Nanda, where He out of fear for Kamsa, together with Baladeva [Balarâma] resided [secretly] for eleven years the way one covers a flame. Surrounded by cowherd boys herding calves the Almighty One roamed on the banks of the Yamunâ through gardens that vibrated with the chirping of the heavenly birds in their many trees. The alluring display of the pastimes of His youth could only be appreciated by the inhabitants of Vraja, the land of Vrindâvana, where He, looking like a lion cub, just like other kids cried and laughed and was struck with wonder. Tending the treasure of beautiful cows He as the source of happiness enlivened the cowherd boys by playing His flute. The great wizards engaged by the king of Bhoja to assume any form they liked, were upon their approach in the course of His pastimes killed by Him who acted just like a child playing with dolls. [To help the inhabitants of Vrindâvana] being perplexed by the great trouble of drinking poison [from the snake Kâliya in the water of the Yamunâ], He subdued the chief of the reptiles. After coming out of the water He caused the cows to drink it, proving it natural again. Desiring the proper use of the wealth of Nanda, the king of the cowherds' opulence, He with the assistance of the brahmins helped them to perform worship for the sake of the cows and the land [instead of Indra]. Indra angry upon being insulted, highly perturbed created a heavy downpour of rain above Vraja. [The cowherds then were] protected by the merciful Lord with His pastime of [lifting] the hill [Govardhana, that served as an] umbrella, oh sober Vidura. 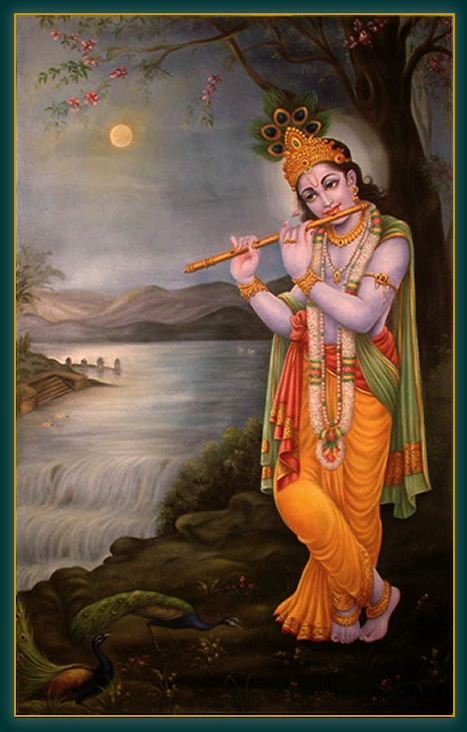 The painting is titled: "Krishna as Venugopal" and was painted by Giri Raj Sharma.